Look, I’ve had some great ideas in my life, and I’ve had some terrible ones. 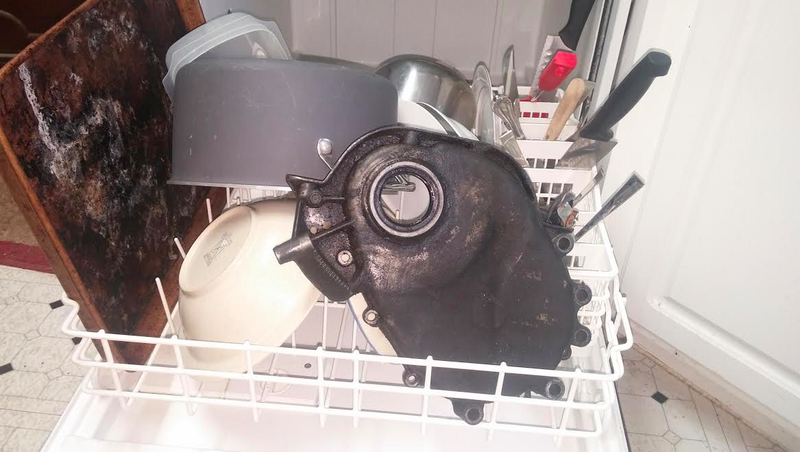 Trying to wash my greasy timing-chain cover in my dishwasher falls squarely into the latter category, as I’ve been eating off dishes laced with oily residue for nine months now. Not all of my ideas can be as brilliant as my motor-oil clothes-dyeing solution, so naturally, I’ve come up with some real duds. Among them: washing greasy car parts in my dishwasher. About nine months ago, I opened up my Jeep’s 4.0-liter inline-six to give it a quick refresh (this was just a few months before I blew it up). As the engine had 250,000 miles on it, there was quite a bit of gunk and grime, so I figured I’d at least try to clean the timing-chain cover. 1. Do I need to clean this timing chain cover? Yes. 2. Does my dishwasher clean things? Yes. 3. Hence, I can put the timing cover into the dishwasher. I wish I had thought a little deeper than those three simple lines of flawed logic, because take a look at what I’ve been eating off of for past nine months. I think I’m slowly turning into an AMC inline-six. I’ve even tried taking the dishwasher apart and cleaning it, but my dishes are still layered with gunk. Not to mention, the timing-chain cover wasn’t any cleaner after the wash.